Michelangelo once remarked that “in painting, the idea is an image that the intellect of the painter has to see with interior eyes in the greatest silence and secrecy.”1 There are two aspects to the comment. One is that meaning in art is veiled and secret; the other that silence is necessary for contemplation and conception. That's why the prophet Jeremiah on the ceiling of the Sistine Chapel has his mouth covered and finger extended in the signum harpocraticum, an ancient gesture of silence signifying profound esoteric knowledge.2 This is not surprising because Origen, Christianity's first theologian, was widely read in the Renaissance and his homily on Jeremiah states that you will not understand the prophet's wisdom “if you do not listen in a hidden manner”.3 Jeremiah's books in the Old Testament, like all scripture and art, require allegorical and esoteric interpretation. 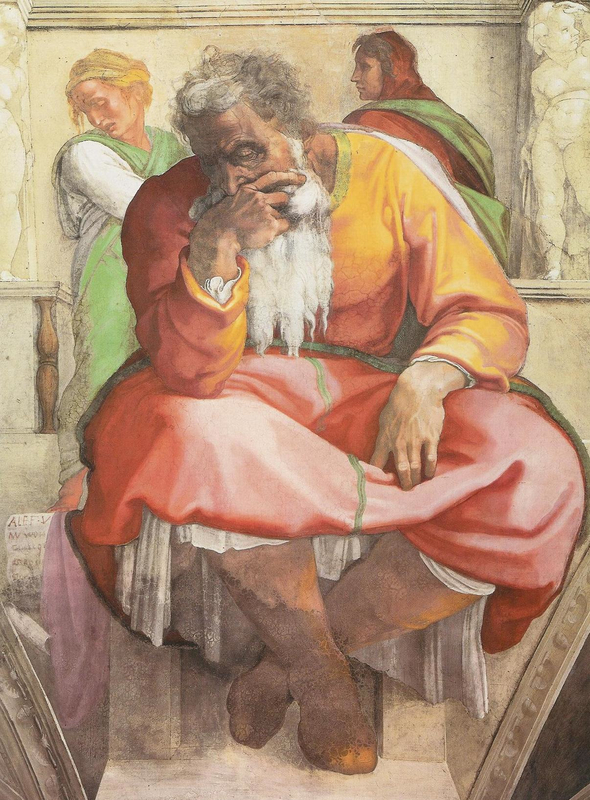 Michelangelo, The Prophet Jeremiah. Detail of the Sistine Ceiling, Vatican. Jeremiah is, as usual, the artist's alter ego and his face may even be the young Michelangelo's idealized conception of what he would look like when old, as Leonardo may also have done to himself in his own "self-portrait".5 Age, after all, symbolizes wisdom. 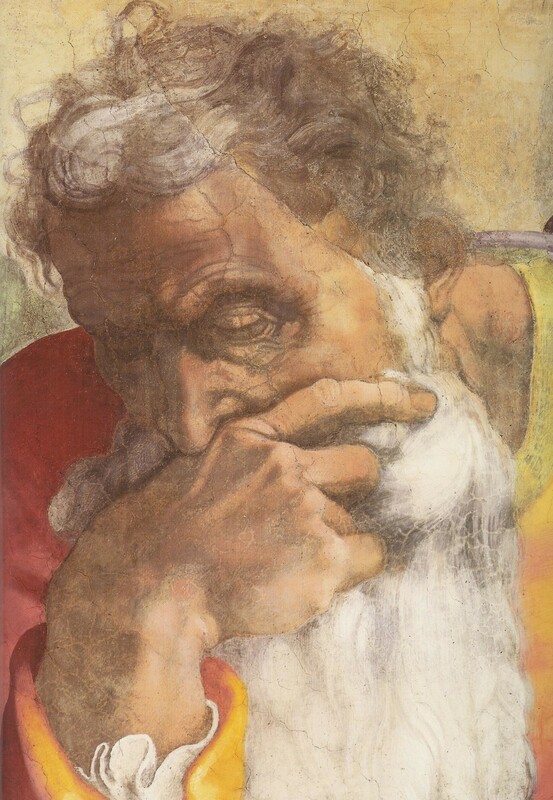 Michelangelo, The Prophet Jeremiah. Detail. The esoteric hint in Jeremiah's gesture is supported by the content of his figure. 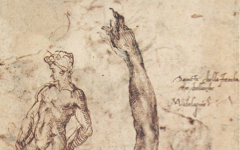 The clenched part of the prophet's hand contains a caricature of Lorenzo de' Medici, the artist's somewhat imaginary "father-figure" who, he later said, spotted his talent and brought him into the Medici household. 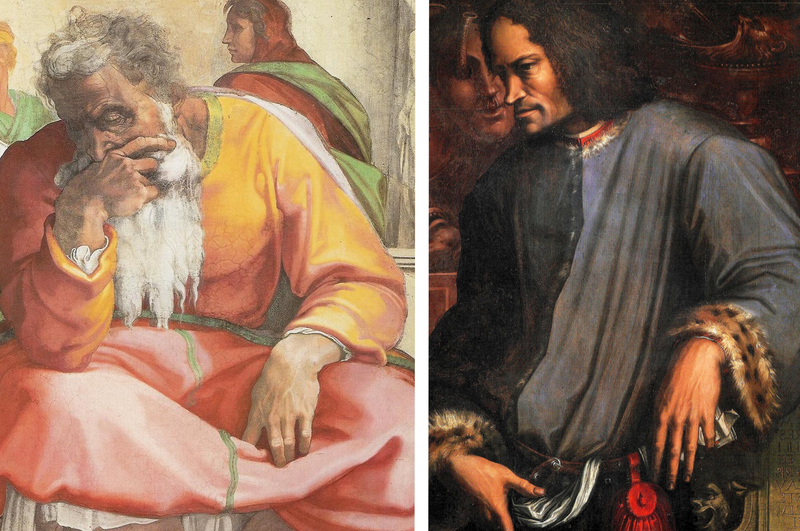 If you compare the hand to Lorenzo's posthumous portrait by Vasari, you should see in Jeremiah's fingers the jutting chin, acutely receding upper lip and the ski-jump nose with its distinctive blunt tip. 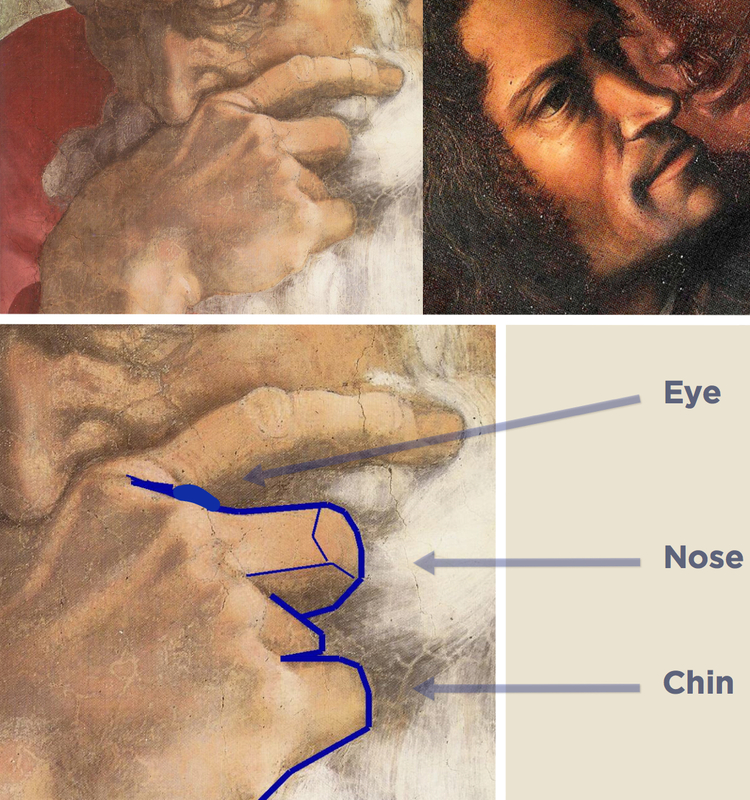 Moreover Jeremiah's pointing finger emerges from a crease representing Lorenzo's closed eye. This thereby unites intellect (eye) with craft (finger). Top L: Michelangelo, The Prophet Jeremiah (c.1509-10) Detail. 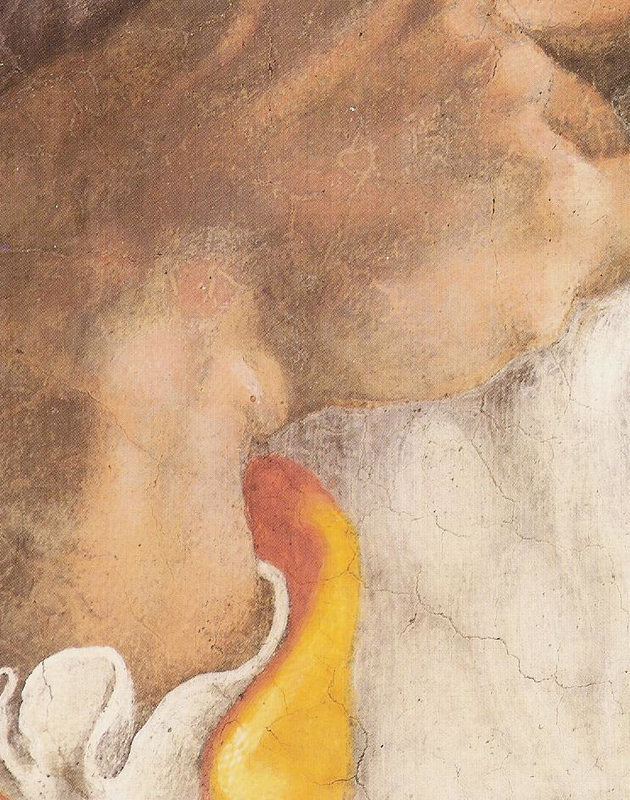 Top R: Vasari, Portrait of Lorenzo de' Medici (1534), Detail rotated and flipped. Oil on canvas. Uffizi, Florence. There is evidence to suggest that Vasari may have known this though he made no mention of it when he described Jeremiah's figure in his book. Is it coincidence that, when one figure is inverted, both Jeremiah and Lorenzo, gazing down at the same angle, share a similar arm with a hand hanging loosely at the wrist? L: Michelangelo, The Prophet Jeremiah. Detail. R: Vasari's Portrait of Lorenzo de' Medici Detail flipped. 1. 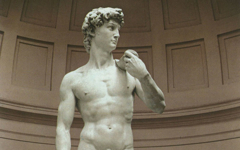 Michelangelo's contemporary Albrecht Dürer said that only good painters can understand art because it "is denied to others, like a foreign language." Little has changed since. The contemporary American artist Philip Pearlstein repeated approvingly that in Michelangelo's day the ordinary man in the street would not have understood the Sistine Chapel and added that it was even more true of his own figurative paintings. And Francis Bacon remarked “Very few people have visual perception, it’s a very rare thing.” This is partly a result of the nature of the visual system which is primed to see the most likely occurrence. It's only when we know what to expect that we can see it. It's a Catch-22 that some minds, not many, are able to work around. Sight's seeming simplicity is why, as Picasso complained, you often hear that someone has no ear for music but never that say she has no eye for painting. Jane Campbell Hutchison, Albrecht Dürer: A Biography (Princeton University Press) 1990, p. 111; Philip Pearlstein Since 1983 (New York: Harry N. Abrams) 2002, pp. 32-3; Richard Davies in Francis Bacon: New Studies (Göttingen: Steidl) 2010, p. 111; Ramachandran, "2D or not 2D" in Richard Gregory et al. (eds. ), The Artful Eye (Oxford University Press) 1995, p. 258; André Malraux, Picasso’s Mask, (New York: Holt, Rinehart and Winston) 1976, p. 116. 2. Blech and Doliner, The Sistine Secrets: Michelangelo’s Forbidden Messages in the Heart of the Vatican (New York: Harper Collins) 2008, p. 214; Jeremiah also holds his hand in the same position as Joseph in a later drawing by Michelangelo known as The Madonna of Silence (Hirst 437). 3. Joseph W. Trigg, Origen (London: Routledge) 1998, p. 56. 5. See Abrahams, "Wisdom and Leonardo's Self-Portrait" (2011). 6. Lorenzo, of course, was not a king but in Republican Florence and in the imagination of his contemporaries he often held the same position. 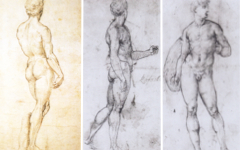 In the story of his childhood that the elderly artist told his official biographer, Lorenzo "discovered" Michelangelo and, in bringing the young boy into his large household, allowed him to grow and flourish in a spiritual and intellectual environment. Original Publication Date on EPPH: 19 Jul 2014. © Simon Abrahams. Articles on this site are the copyright of Simon Abrahams. To use copyrighted material in print or other media for purposes beyond 'fair use', you must obtain permission from the copyright owner. Websites may link to this page without permission (please do) but may not reproduce the material on their own site without crediting Simon Abrahams and EPPH.